General concept: TEG is basically a worker placement & resource building game. Each player leads a society on the brink of expansion and must utilize energy and culture to expand their society. Players send their fleet of ships (two at start) to different planets, each of which has a special action/ability which can be utilized, as well as a resource to be collected, either energy or culture. players can attempt to claim the planet, its victory points, and its special ability by progressing through the planets orbit track. 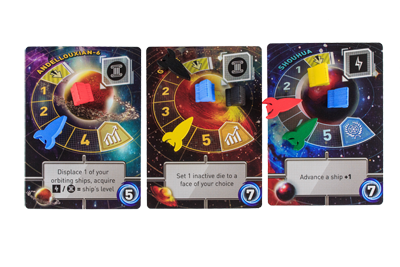 To progress ones ship along the orbit track a player is required to utilize one of two other resources, economy or diplomacy, which are provided by the dice or a planets ability. 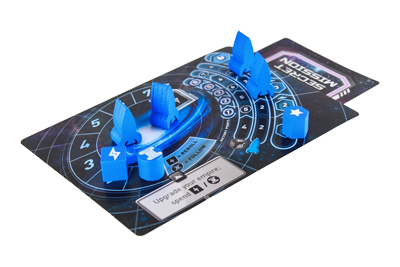 Players can spend culture and energy to expand their societies development level, increasing victory points as well as providing more ships and dice to roll each turn. The dice: 6 sided dice with 6 different result: Develop, economic influence, diplomatic influence, move ship, energy, culture. players are allowed one re-roll and can spend energy to re-roll further (1 energy : 1 re-roll ratio). Each die is activated one by one until all die are utilized or a player declares they are stopping. What makes this game unique? One of the main mechanics of the game is the “Follow” option. During another players turn, once the player has declared that they are activating a die, all other players may spend 1 culture to use that die effect as their own, right then and there. If a player moves their ship, another player can spend one culture to move one of their ships to where ever they want, they don’t have to literally follow the player they are “following”, instead they are allowed to take the action as if it was their own. Overall: Im not a big fan of resource management games or worker placement games but this is one of my favorites by far. A lot of strategy in this game makes it great for those intense gamers that analyze everything, but its also great for casual gamers who want something that is not hard to learn or set up. 30-45 minute game play with 4 players. Because I’m one of the idiots who lives in it! In Tiny Epic Galaxies, players race to be settle the most planets, securing 21 or more points. The way this happens is through dice rolling. The game utilises a Push your Luck mechanic to keep gameplay engaging and quick. You are able to reroll any dice that are yet to be activated which really sets this game up for a win. A lot of the strategy in the game comes from the management of dice activation. You are able to activate in any order and if managed correctly you can take all those useless dice and turn them into a game winning turn. Another key feature is the follow mechanic, which allows other players to copy the action of the active player by spending Diplomacy. This keeps the game from becoming stale during another players turn which is great especially for a 5 player game. The game has a few nuances to it but overall it is a rather simple game to pick up while still offering the tactics that gamers are looking for. It’s not as simple as a game like Catan or Takenoko, however you should have no trouble teaching this to anyone, as long as they are engaged and want to learn. Tiny Epic games where designed to be taken anywhere and played any time. This is one of the most charming features of Scott Almes little family of games. Galaxies is a great little game that is easily digested which will have you coming back for more and more. The components are adorable, all are lovingly crafted and the imagery of the cards and the layout really works, but what is most impressive is the form factor. The game fits in such a small package for the amount of game you get from it. Most games spanning 30-40 minutes will require something close to the size of Codenames or Munchkin at least, But Almes has been able to stay true to his Tiny Epic mantra. While you need to willing to learn the ins and outs of the game (mostly the die face and what they mean) the game is relatively easy to pick up. While a reference sheet per player would of been great (ala Bang! The Dice Game or Love Letter) the flow of the game is fluid and many while find this a breeze to pick up. The game does have a solo variant and while it is enjoyable and challenging, it really pales in comparison to the thrill of taking on your friends. The game does go all the way up to 5 players and while I think its sweet spot is 4, the extra player doesn’t ruin the experience for me. The Theme is here, but mostly just to set the motivation, You are all vying for control of the galaxy. I guess its somewhat akin to the motivations found in risk or games of the like, you want to control everything and screw everyone else! But as for thematic story telling? Well you’re just not going to find that here. Tiny Epic Galaxies is a smash entry into the Tiny Epic family, Scott Almes set out to make small, exciting games that can be taken anywhere and he has succeeded. 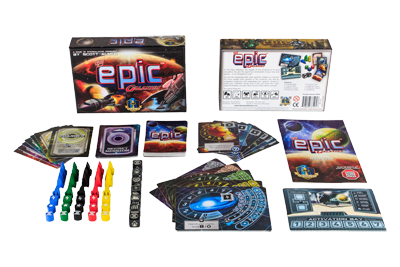 If you love games like Roll/Race for the Galaxy, but need a lighter alternative when teaching them isn’t the best option, or if you just want a light space game that can fit in your back pack, be sure to check out Tiny Epic Galaxies. This game is perfect for bringing a new player into your gaming group. It’s light, quick and not too many components. You can get multiple plays in a night. It takes a few rounds to get the hang of how your energy and culture work but once you do, it’s a thoughtful game of trying to figure out the best way to play your dice. I got a small sense of Yahtzee with a space theme with this game. I had a lot of fun playing it. This game is worth adding to your game collection and may hit the table from time to time. Add a Review for "Tiny Epic Galaxies"